Log Homes, Just Seasonal or Year-Round? Can You Live in a Log Home Year Round? Looking for a home comes with a variety of choices, one of the most important being the material of choice. This ranges from stone, and wood, to iron sheets. Each of the materials comes with their costs and benefits. However, wood logs are, and have for a long time been a very trusted material. The major concern is whether it is an ideal material for a home all year round with the changes in seasons. Choosing a log home is actually great to suit any time of the year. Log homes tend to have the connotation of only being a winter getaway, somewhere you don’t stay unless snow is on the ground. Well, the following aspects have made it possible for people to live in a log house all year round. Log cabins are good because the material doesn’t really readily allow for either extreme temperatures. When the temperatures are hot, your home remains cool and when it is cold outside, your home remains at normal temperature. Log homes come with this added advantage, making them unique and comfortable all year round despite changes in weather. You may not need appliances to regulate temperature in your home, which translates to tons of money savings. Log homes remain comfortable all year round allowing you to enjoy the best any time of the year. This is not just with the furnishing and gadgets in the home but also because the logs add to the functionality and décor of the home. Keep in mind that the standards for building log cabins are very high so you will not be compromising on anything concerning comfort. You can craft your home to be as comfortable as it can be for you. Protecting the environment is important not just as a slogan of going green but also because it is beneficial to you and future generations. Well, there is no need to compromise on your health from time to time in a year. Being in and around nature is good for us as people, breathing that cleaner air and being closer to your roots. Who said that because you have a log cabin, you have to compromise on the amenities you have inside your home? This may have been the case years back, but with the advancement in technology, you can own a cabin with everything modern. You will not have to feel like you are missing anything simply because you are living in a log home. Traditionally, many thought log homes were weak and that they did not last long. Currently, technology has made it possible to make them durable, environmentally friendly, and comfortable with a higher degree of support and structural integrity. So if you’ve been concerned about getting a log home because you didn’t think you’d be able to use it year-round when you wanted, you can put those concerns to bed now! Contact us if you want to talk more about log homes! How Hard is it To Keep a Log Home Warm? Is It Harder To Keep A Log Home Warm? Are you planning to invest in a new home soon and just trying to figure out what’s best for you? Investing in a home is not a small or simple investment and every homeowner needs to do proper planning. You need to ensure you have solid house plans that add value to your home and provide a warm, secure and welcoming homely environment to everyone. Log homes in NC are the trendy housing solutions for families with elderly people or little kids alike. Anyone who wants to live in a home that keeps warm even during the peak of the cold seasons. So, if you are wondering whether it is harder to keep a log home warm than a “normal” home, Quality Log Home Builders NC has got your back. If you want to invest in log homes in NC, working with highly experienced log home builders is the way to go. Quality Log Home Builders have been log cabin specialists for over 35 years now. This means they know exactly what every homeowner needs and they are the pace setters when it comes to building quality, modern, warm and cost effective log homes in NC and even beyond. By working with a team of friendly, highly experienced and energetic staff, they listen to your needs and help make them a reality for you. They’ve been working with individuals of all walks of life in Eastern North Carolina to providing affordable housing solutions for everyone. You can trust them to come through for you. If you are wondering how apt a log home is at retaining its’ heat through the height of a cold winter, Quality Log Home Builders knows how to do it better. They build exceptional log cabins with solid logs that are able to keep your family warm all-year round. The types of logs they use does not require any insulation since logs themselves provide natural insulation. They are able to retain heat in the room during cold seasons and also block heat from outside to enter the room in hot seasons. This ensures your family’s comfort and relaxation every day of the year. It’s true that log homes are subject to air leakage more so than the normal home may be. This is due to the normal contraction and expansion of the logs, creating space for air to move in or out of the room. To minimize this air leakage and offer you a housing solution that keeps you warm all through, Quality Log Home Builders specialize in find quality seasoned logs. Their logs are dried in a protected space to increase their effectiveness. They also kiln dry their logs before they finish shaping and installation to deal with gaps. With their insecticide treated and water proofed logs, moisture will never bother you. How Do I Find My New Log Cabin Home? For exceptional professional services with log homes in NC, make Quality Log Home Builders your partners today and the rest will be history. To answer the original question, yes, log homes are just as easy (or hard) to keep warm as a normal home would be. So, if all you need is a log cabin home and you don’t know how to go about it, your help is just a call away. 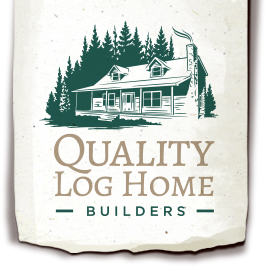 Contact Quality Log Homes Builders now or visit their website for a complete solution. Is a Log Home Kit Right For You? Who is a Log Cabin Kit Best For? Building a log home may sound challenging, but if you use a log home kit, you will have a much easier time. What is included in a log home kit can vary from one company to another, but we generally include the logs, pre-cut to your specifications, a building plan to follow with instructions, and shipping to your lot, as well as unloading everything somewhere for you. Some companies like us offer assembly and finishing if you so choose. The log home kit is best for someone who wants to handle their project themselves from start to finish, and be able to alter or change any detail they want. However, you do need to plan and consider some things before you jump into buying a log home. It’s a safe assumption that most of us enjoy staying in log home. The look and feeling alone is enough to make us feel relaxed and one with nature. The advent of the kit has also given us a lot more options as far as home designs go and log cabin kits made it easy to assemble and build, especially for those homeowners who love having a hand in different projects. Do You Sacrifice Integrity Going With a Kit? Some people are hesitant about considering these kits, mainly because they think that it will not be as strong as a traditional-built log cabin. If frontiersman of old built their cabins by felling and notching whole trees, sealing in the gaps with a mixture of mud and straw and chinking, manufacturers of home kit construct their cabin kits with milled solid timbers, using a variety of tongue and groove interlocking methods so as to keep out the air as well as moisture. Additionally, the joints are sealed with plastic caulking and gaskets. So yes, they are just as strong as a pre-built home would be, and far stronger than any log homes built in the past. Before you get a kit you need to find out the contents and ensure it’s all of what you need. Most kits come in complete packages with all the logs pre-numbered and pre-cut and may include roofing materials, windows, doors, interior partitions, stairs, railings as well as garage doors. If you need more logs or need to notch some on location, your best bet would be calling in a professional crew to get that part done. The kit you select will depend on the amount of work which you intend to do and what works best with your chosen site and goals. Do You Still Use Good Wood? Log home kits may also be manufactured with different kinds of wood including white cedar, oak, and Douglas, all based on the abundance in the location of the manufacturer. Remember that the wood does not directly dictate the quality but rather will depend on your method of treatment as well as maintenance down the road. Care for your cabin and it will care for you. When you choose a cabin kit, do keep in mind that you will still need to spend money for the interior of the cabin which includes plumbing, electrical wiring, fixing and lighting amongst other things. You can save money if you don’t opt to buy high-end furnishing, and you can put anything you want (or don’t want) in there. Lastly, when choosing your kits, ensure you get it from a reputable manufacturer so as to get all the appropriate assistance and information needed to be able to build the absolute best cabin for yourself. If you are interested in a log cabin kit, check out our site! We offer full service building and turn-key sales as well, please contact us if you have any questions! Is This The Year You Finally Get A Log Home? As the New Year approaches, do you have any resolutions in mind? Do they cater to your dream log cabin house? Make use of the New Year and build your very own log cabin. The change of scenery might be exactly what you need to fulfill your resolutions. You might be wondering how you could own a log cabin on a budget. Well, you have the option of building the log cabin on your own using NC log cabin kits. A kit is the best way to begin because it helps you to do everything according to your own set standards. A growing trend is focused on how much consumers enjoy personalized goods and products. This has affected the building industry in that more people are willing to spend more on personalized designs. People are ready to purchase and have items and products that meet their personal tastes. Custom houses have become popular and are expected to gain more popularity in the coming years. Log cabin kits are the best option when making your dreams come true. NC log cabin kits are the best way of starting out within your personal preferences and budget. You can get the best kits at Log Home builders NC. Log cabin kits contain building materials that help in creating a log home. The price of the kit depends on the expectations and interests of your log cabin. Nevertheless, the materials needed include doors, windows, and the logs. You have the power to include any other features of ideas that you want to! The kits have many alternate options compared to the traditional homes. They are artistic and offer nearly unlimited control when it comes to detail. Start by getting the necessary materials that are the logs, windows and doors. To speed up the process, you could buy a kit that most closely fits your needs. This will also save on the cost for people who are working with a strict budget. The biggest advantage of a cabin is knowing that your materials are within the code. You have to decide if you want to build it on your own or employ a contractor. This will give you an idea of the budget and the length of the construction. If you decide to build it on your own then you will have to do some personal research and it will take much longer, but labor will cost you nothing. This research will help you stick to the local building and development codes. Alternatively, you could have an expert build it but that will greatly increase your costs. The ability to create a home from scratch to meet all your needs and dreams is the driving force for people who purchase log cabin kits NC. Through this customization, you are able to build a home that fits within your budget. This is a good financial step for people who want to have log cabins in the New Year. If you want to get to the New Year with an affordable home, then a log cabin kit from log home builders NC are the best option. Could A Smaller Cabin Be Better For You? Loving the outdoors and appreciating quiet serenity is a love all log home owners share. Often, people just want to escape the busy city life for only a weekend and enjoy nature as they explore it. They want to be able to wake up and see the mountains. On the other hand, they don’t want to spend lots of money on a big cabin for no reason. Fortunately, there exists plenty of small cabins options. Think about it, you don’t need space when you’re not there and you don’t need all that much when you are a smaller log cabin could be exactly what you’ve been looking for. So, why should you go for a small cabin? A small log cabin will not need a lot of equipment or materials. You only need a couple of full sized logs for the whole cabin. Having to buy less materials will of course be an avenue for saving money. Furthermore, a small log cabin offers you the opportunity to take on the project by yourself if that’s something that you’re interested in. Whether you do it, get family’s help, or pay a contractor, you’ll still be saving money in the grand scheme because you just have less that you need built. A small cabin will also save you money in the sense that you will not need to buy a massive piece of land just to accommodate your home. You only need a small portion for the small cabin, leaving more room for nature of whatever else you may have in mind for your property. In addition, it takes a lot less time to build a small cabin. Less time is needed to physically put all of the parts together, while more attention can be paid to ensure everything is done perfectly. You just don’t quite get the quality or speed with a larger cabin. We are always wanting peace of mind when it comes to the security of our homes. It is unfortunate that a lot of large homes are targets for theft. Everyone feels better when they’re in a safe place. With a small cabin, you can easily install posted signs, security signs and security cameras such as trail cameras. There is less ground to cover. With the mountains also comes the fear of bears and other large animals, it’ll be easier to bear-proof a smaller cabin when the time comes. A small cabin can of course be cleaned far faster than a larger one. You can divide the job up and get it done very quickly. A large cabin needs more time to be cleaned because of the sheer amount of space, and it’s a lot harder to divide it up into tasks and conquer it that way. In the end, you may find that some places never get the chance to be cleaned, but that won’t be the case in your small cabin. As we mentioned, log cabin owners are just looking to enjoy nature and relax. Unfortunately, a large cabin can make you get so comfortable that you forget about the outdoors. On the other hand, a small cabin means that you spend more time outside, or at least closer to it. Not that the cabin is uncomfortable, but because you want to explore and the outside is right there looking back at you. Nothing is wrong with having a small log cabin. They are perfect if you are looking to get away for a reasonable price. Log Home Builders can help you with construction of your small log cabin. Do Log Cabins Have Styles? Handcrafted logs tend to give your cabin a more organic feel. They are cut and shaped purposely to stack perfectly on top of one another and form a tight seal in the walls of your cabin. They can be shaped into rectangular profiles with flat exterior and interior faces in order to give you a more historic look if that’s what you’re after. Since handcrafted log cabins are larger, they often will come with a higher price tag. Our company, Log Home Builders, offers the highest quality of handcrafted cabins. Milled logs are precisely cut into similar sizes and appearances. They can either be fully rounded or squared on the ends. The beauty of milled logs is that they can be used to create super-insulated exterior walls. Dimensional log siding has been used by log building companies for a long time to give log cabins the best possible natural insulation. With that added insulation comes lowered energy costs and more long term savings! Log sliding also adds color and durable material to the milled wood, making it very low maintenance overall. You really can’t miss the distinctive look that a milled wood cabin gives. Timber frames are best known for giving cabins an amazing flair of internal beauty. They also allow for wide-open spaces inside your home, massive rooms that you can host people in or do anything you like. These frames are built by utilizing hand-carved joinery which is interlocked with wooden pegs. The precision required for such methods to work is extreme, so you can rest assured that the utmost care was given in the construction of yours. The timber frames can be enclosed in the frame of exterior walls. Furthermore, these frames have structural insulated panels and SIPs which makes them uniquely weather resistant. They wrap the frame in an envelope of insulation, saving you even more money on your home and regular costs. Conventional studs are framed onto stick-built cabin walls. Since stud-framed construction uses widely available materials, many cabins have the stud-framed cabin design. The styles usually associated are shabby chic, farmhouse, mountain or traditional. The conventional style of cabin building has a range of prices depending on the region, finishes and complexity of your building plan. This is the most popular and widely-loved style of cabin building. It involves shipping built in sections/modules of the cabin in a company’s indoor facility to the construction site. The modules are then placed on a permanent foundation. Modular homes are available in all shapes, sizes and styles. Such homes greatly minimize waste and give you a product you know you can rely on. Furthermore, modular cabins surpass the energy-efficiency standards. Modular cabins are perfect for remote sites. Log Home Builders provides the best modular log cabins available in North Carolina. The log cabins for sale in NC exist in these different styles and designs which are a result of the different materials and types of logs used. When choosing your cabin style, you have got to strongly consider the climate in the area of residence. For example, milled log cabins and modular cabins have great insulation which is perfect for really cold regions. Log home builders are the best log cabin builders and sellers in NC. We offer quality and affordable cabins that suit all your needs at pocket friendly prices.